This is part buddy cop and part Disney movie. It's a strange combination that doesn't work on paper, but it works beautifully in All-New Wolverine #7. There are any number of rules with notable exceptions in superhero comics. There has to be, in a world where the laws of physics are only as rigid as a writer's fluency in technobabble. However, it also works the other way around. Certain exceptions, so to speak, create rules that become unspoken laws of sorts. Few concepts have as many of those laws as clones. Thanks to Spider-Man and his infamous Clone Saga, a generation of comics had to function under the unwritten assumption that adding clones to a story is like giving alcohol to the Hulk -- it's just going to create a messy situation at best and a migraine-inducing catastrophe at worst. Then, X-23 comes along and these unwritten assumptions and unspoken laws start to crack. It's still astonishing to contemplate, a character who started out as a side-plot on X-men: Evolution is now carrying on Wolverine's legacy. It only feels less remarkable when Laura Kinney's history is given some extra scrutiny. Unlike most clones, she doesn't look too similar to her predecessor. That might seem easy since she's a teenage girl and Wolverine is a gruff, hairy Canadian that made Hugh Jackman famous, but it's the extent to which she set herself apart that makes her worthy of carrying on Wolverine's legacy. In every way Spider-Man's clone stories fail, X-23 succeeds. Tom Taylor builds on that success, showing time and again that X-23 deserves to go by Wolverine. However, he takes a chance in the first arc of All-New Wolverine by introducing even more clones into the mix. On paper, it sounds like an idea that would make Peter Parker bang his head against the wall, building a story around clones of another clone. In All-New Wolverine #7, however, Taylor gives valid, concise, and wonderfully dramatic reasons why this story is worth building. 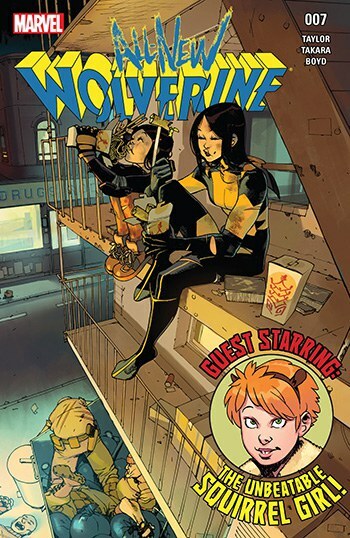 While the premise of All-New Wolverine as a whole might make Peter Parker cringe, even he would smile at the way All-New Wolverine #7 adds an element of dramatic weight that is rare in clone stories. Taylor doesn't just move the plot forward from the first arc, which has X-23 meet her clone sisters, only one of which ends up surviving. He establishes some uncanny parallels between X-23's current situation and the one she faced with the non-cloned Wolverine prior to his death. These parallels are important. They're also instrumental in the core character of Laura Kinney. Through the use of a flashback that doesn't create more confusion than it resolves for once, Taylor establishes Laura's emotional vulnerabilities during a time when she is woefully under-qualified to be Wolverine. She carries herself less like a clone and more like a troubled teenage girl who doesn't want her father to leave. It's more emotional range than most clones dare to show and for those whose exposure to clones is limited to Star Wars prequels, it's incredibly refreshing. For Laura Kinney, being X-23 means being tied to James Howlett. However, the former Wolverine treats her less like a clone and more like a daughter. He shows that he learned from Peter Parker's mistakes. He convinces X-23 that she can build her own life and be her own person. Now, she has to do the same with Gabby, her prepubescent clone sister. It's a cloning challenge that even Spider-Man can't wrap his head around. This is where Taylor keeps the story from becoming too melodramatic. He does this by bringing Squirrel Girl into the mix, who is the Marvel equivalent of warm teddy bear coated with fairy dust. In most circumstances, she seems out of place in any Wolverine story. 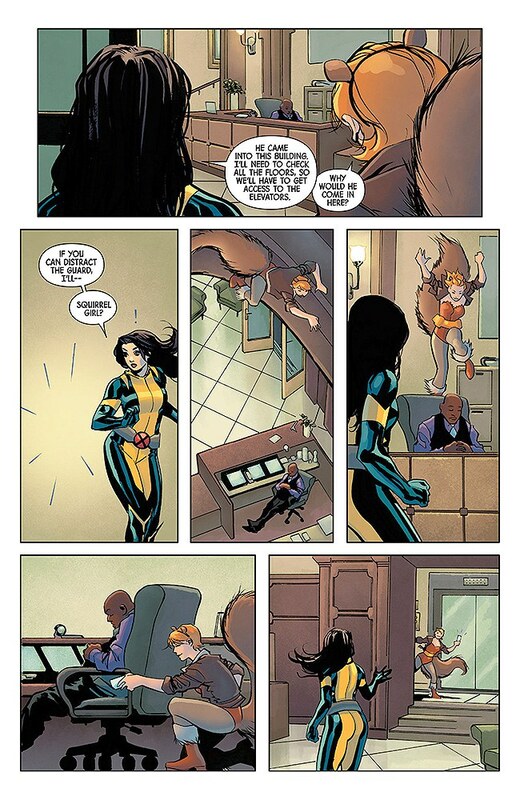 In All-New Wolverine #7, however, her arrival is downright therapeutic for Laura. For someone whose coping skills consist primarily of growling and stabbing things, it's pretty jarring, but in a good way. This team-up doesn't lead to the kind of violent, bloody brawls that dominated the previous arc of this series. It doesn't even lead to a greater progression on the overall narrative that has been unfolding X-23 since All-New Wolverine began. It's just a cute little story where a troubled teenage girl helps an adorably cheerful teenage girl. It's part buddy cop and part Disney movie. It's one of those strange combinations that doesn't work on paper, but it works beautifully in All-New Wolverine #7. Nobody gets stabbed. Nobody gets bludgeoned. In fact, it only gets marginally tense when Squirrel Girl demands to take a selfie with Laura. She does it less begrudgingly than James Howlett would've done, another clear distinction between her and her predecessor. For a clone, those distinctions are important. This sort of light-hearted aside is a genuine rarity for a Wolverine story, but it's also refreshing. It helps emphasize that X-23 isn't just Wolverine's clone. She's a teenage girl who's trying to make the best of a complicated, confusing situation. She succeeds far more than Peter Parker ever did, but there's still plenty of room for improvement. The lack of visceral action is strange on some levels, given all the stabbing and growling in the previous arc. 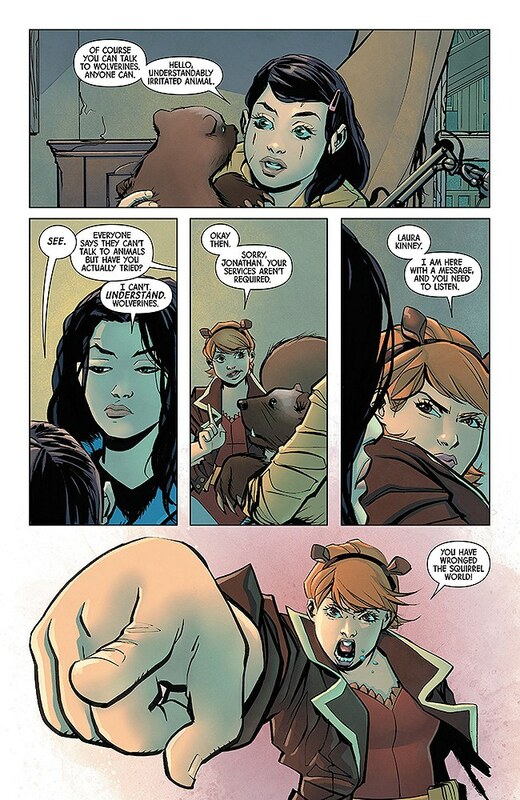 Indeed, at times, All-New Wolverine #7 is a little too light-hearted, but it succeeds in one important way: it gives Laura greater perspective in terms of helping her new clone sister, Gabby. In the grand scheme of Wolverine's bloody legacy and Laura Kinney's dedication to keeping those blood-stains fresh, All-New Wolverine #7 provides a kind of dramatic context that's easy to lose in all the stabbing. That context might not be critical in moving the narrative forward as a whole, but it adds layers to X-23's persona and, as the Ben Riley's of the Marvel universe can attest, a clone can never have too many of those.